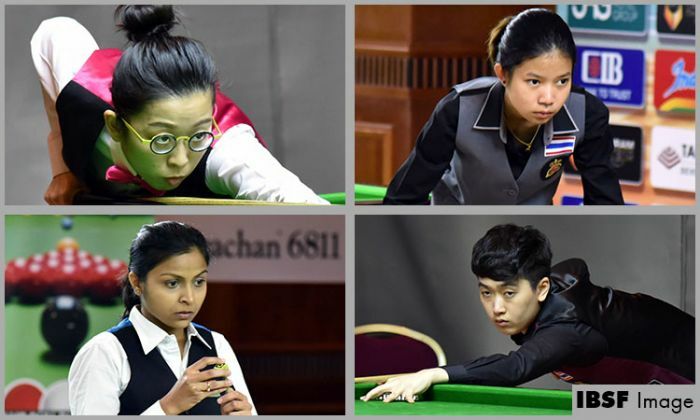 The other three women players who have reached in the semi-finals are Indian player Amee Kamani and players from Thailand Waratthanun Sukritthanes & Nutcharat Wongharuthai. Ng On Yee went thru stiff competition but secured 4-2 win in quarter final match against Siripaporn Nuanthakhamjan of Thailand. Initially Ng On Yee scored heavily and was leading 3-0 (49-06, 42-05, 36-13) but after that Siripaporn sent recovery shots and took away two frames. Before Siripaporn could do any further damage, Ng On Yee won the sixth frame 47-23 and confirmed medal for her. Indian player Amee Kamani performed really well and ousted the Hong Kong player Ip Wan In Jaique in straight set of frames 4-0. Amee was striking well and maintained her supremacy throughout the match. Though she faced some turbulence in second frame where Jaique obtained initial lead but Amee was quick to clear the table on first available chance and raised her lead 2-0. Even after that she made a classy break of 54 points to continue her winning streak. In other two semi-finals, World 15Red Snooker champion Waratthanun Sukritthanes and her compatriot Nutcharat Wongharuthai knocked out their opponents Pui Ying Chu of Hong Kong and Anastasia Nechaeva of Russia to confirm their entry in the medals round. Waratthanun struggled at times as Ying Chu was giving her tough fight. She took away second frame and even was close to win fourth frame too but in the last moment Waratthanun managed to win the frame on black ball to take 3-1 lead. After that she didn’t give any chance to Ying and made break of 51 points to close the proceedings 4-1.